There is going to be a lot of talk about “Hereditary”, it’s the type of film that exists to disturb, bother and create conversation. First time feature filmmaker Ari Aster floored audiences when “Hereditary” debuted at Sundance earlier this year. It’s not simply that his film is frightening or distressing, it’s the quality of his writing, the masterful performance by Toni Collette (“The Way Way Back”) and the way it persistently throws the viewer off guard. For those brave enough to watch “Hereditary”, I can’t recommend enough staying away from spoilers. That being said, the trailer is one of the year’s best, a nice overview without spoiling anything. However, nothing will prepare you for the content in this film. Annie Graham (Collette) describes her mother as a private, difficult person at the funeral. “Should I be sad,” she asks her husband Steve (Byrne) later in the day, desperate to find the right emotion. Of their two children, it’s only daughter Charlie (Shapiro) who seems bothered by her grandmothers passing. Pothead son Peter (Wolfe) continues getting high with his buddies, trying to impress a girl in his class. Annie begins to sense things around their secluded Park City home as she works on miniatures in her shop room. Eventually she is compelled to attend group therapy, but Steve senses his wife unraveling and dare not tell her about the phone call from the cemetery. An elaborate, vexing, top notch horror flick that reminds us how talented Toni Collette really is. With a film like this, where secrecy is half the fun, it’s difficult to provide an accurate description and mention all the best elements in the story without spoiling anything. I will say the twists and turns in the script are always earned and never feel like a gimmick. The narrative structure is like “The Witch” and “The Sixth Sense”. For over an hour everything presented to the viewer is plausible, this allows us to understand all four main characters and for the most part care deeply about what happens to them. 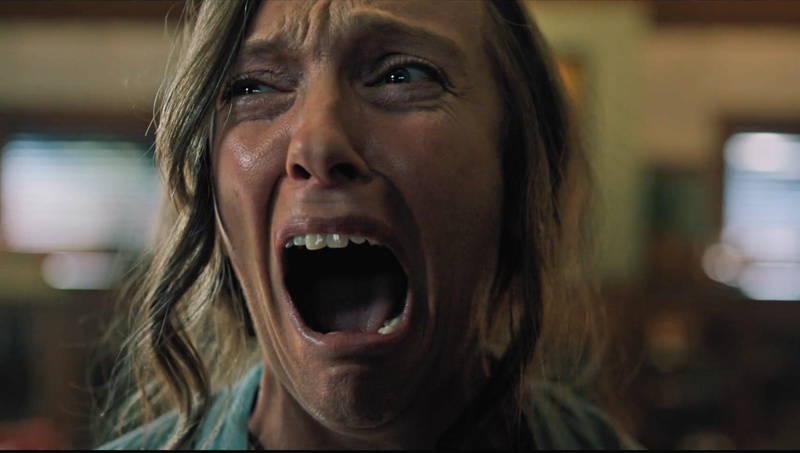 There is nothing that works so well in “Hereditary” as Collette’s performance. The Oscar nominated actress goes to some extraordinarily dark places. Collette is a master of facial expressions and twists her face into the most unforgettable manner. She raises the bar for acting in horror films. The set and production design are also award worthy. From the intricate detail shown on the miniatures Annie tinkers with, to the way the camera maneuvers around the house. “Hereditary” offers a lot of important information to the audience, not altogether complex plot points to follow, but a lot happens during the course of this film that runs slightly over two hours. The third act is where horror fans will rejoice and those more interested in the psychological and dramatic elements of the film will want to jump ship. Like the best horror films, this is a slow burn with pacing that allows the viewer to soak in every uncomfortable detail. There is more than one piece of imagery and scene that will be burned into the audience mind for days after seeing the film. Hate it or love it, Collette’s performance will be among the very best of the year.